Audet & Partners, LLP is investigating claims of Toyota electrical problems by owners of Toyota vehicles who have reported recurring electrical failure. Information has recently come to light that Toyota vehicles in model years 2012-2016 incorporated a soy-based wiring insulation that has been found to attract rodents. Rodents then work their way into the Toyota engines and gnaw on engine wiring, thus causing disruptions to the vehicle electrical system. Toyota owners who have discovered these electrical problems report that despite multiple requests, Toyota has denied warranty claims made during Toyota’s New Vehicle Limited Warranty covering 3-years/36,00 miles. 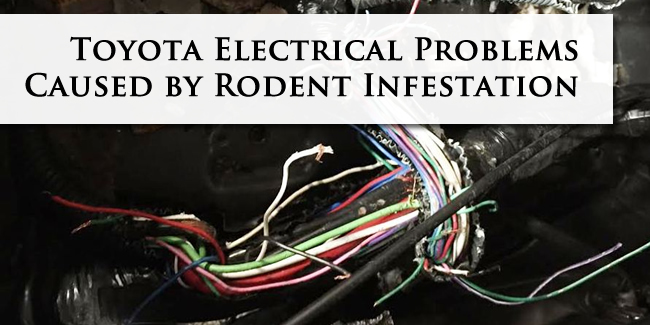 Repairs for these extensive electrical problems caused by rodent infestation can often cost thousands of dollars. If you purchased a new Toyota vehicle, model years 2012-2016, and experienced problems with electrical failures that Toyota refused to cover under its New Vehicle Limited Warranty, you are urged to contact Audet & Partners, LLP for a free, confidential case evaluation by one of our product liability attorneys. You can contact us either by completing and submitting the inquiry form on the right side of this page, or by giving us a call at (800) 965-1461.